The mainland of Morrowind hosts many varieties of undead. Some of these will be familiar to seasoned travelers from Vvardenfell, but there are new varieties of some undead, as well as terrifying new additions. A full list of creatures can be found here. Mummies are the remains of the buried dead, trailing the bandages with which they were wrapped after having been embalmed. Although their attacks are fairly weak, mummies can infect the unwary with the disease Brain Rot. Plaguebearer mummies are even more deadly as they are infected with a remarkable range of diseases: Astral Vapors, Ataxia, Chills, Collywobbles, Dampworm, Greenspore, Helljoint, Rockjoint, Rust Chancre, Serpiginous Dementia, Swamp Fever, Wither, and Yellow Tick. Lord Drolar is a unique lich found in Drolar Manor Ruin. Sabine Valtienne is a unique lich found in Ruinous Keep. 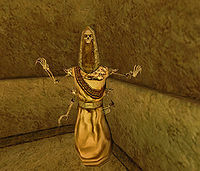 If the liches found under Mournhold were bad enough, the ones that inhabit the rest of mainland Morrowind are worse still. The Plaguebearer Lich can infect the unwary with Chrondiasis, Caliron's Curse, Wizard Fever, Astral Vapors and Chills, but the Greater Lich is even deadlier. In addition with being able to infect you with Chrondiasis and Caliron's Curse, it also continually regenerates health and magicka and can summon a range of lesser undead to aid its attack. It also has a nasty reflect ability to deter using spells on it. Only one Leveled list using the Greater Lich is currently used and is only used in one location: Harru Cavern. 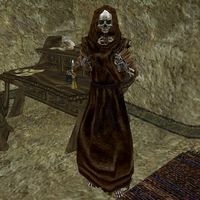 Bonelords on the mainland are similar to those found on Vvardenfell but can typically infect the unwary with even more corrupting diseases than their island-bound counterparts. Larger and more powerful than the examples on Vvardenfell, the Greater Dwarven Spectre can pose a severe threat to inexperienced characters. A common form of undead found guarding graves and tombs throughout the mainland. This page was last modified on 6 March 2019, at 09:11.